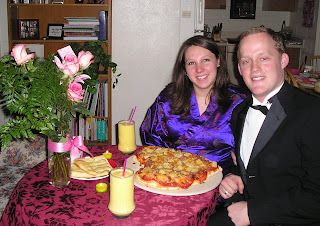 rolling bread dough into a heart-shaped pizza crust...yummy! more paper hearts that I apparently haven't found yet! going to bed and sleeping in!!! How cute for you guys! 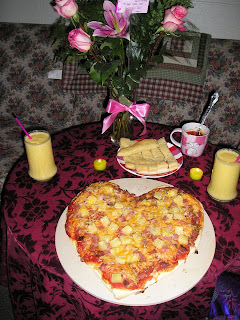 How did you make that pizza heart shaped? Looks like you had a fun valentines. We got frosted sugar cookies from Steven and Erika, and Susan's kids. It was fun. Aww, you guys are such cute lovebirds. What great examples to the rest of us! We're excited for you & for Baby Heather's arrival. She's one lucky girl. We love you! We rolled out a big circle and then we cut away everything that didn't look like a heart :) We tried to roll the excess dough back into the heart, but we had only marginal success with that step! We watched the classic chick flick "While You Were Sleeping."